This is the healthy side dish that you’ll want to make again and again. Plus, it includes my favorite grain: farro. 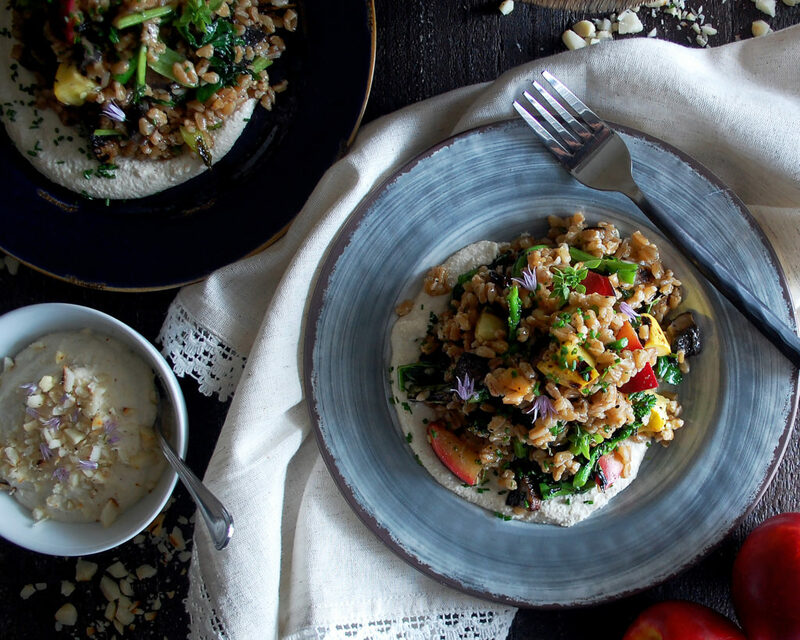 If you haven’t tried farro, it’s time you go to the store, buy a package for about $2, and get it on the stovetop. 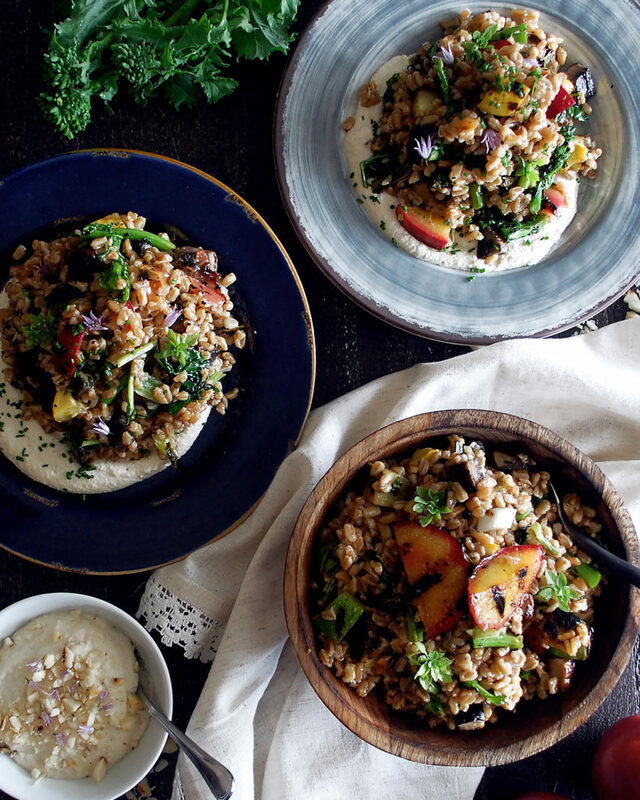 Farro is one of my favorite grains to cook with. The texture alone, when cooked properly, is amazing…soft with a slight chewy bite. I really enjoy the taste as well. 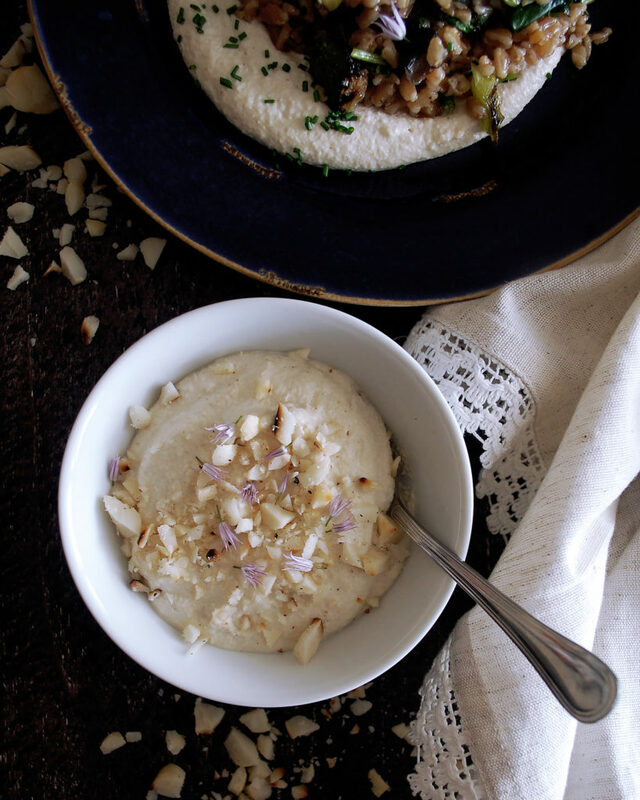 It’s nutty and earthy, with somewhat of a buttery richness to it (but, maybe that’s just me). I usually eat farro warm, sometimes even completely plain alongside a piece of meat and some vegetables. I figured it was time to do something a little different with it, so I decided to bring back one of my favorite vinaigrettes (which I made for this Artichoke & Burrata Pasta Salad) and create a farro salad with tons of grilled vegetables (even some peaches) and a creamy goat cheese macadamia butter for the bottom of the plate. It’s a charred lemon vinaigrette with fresh basil, by the way, and honestly, I think it would make just about anything taste good. 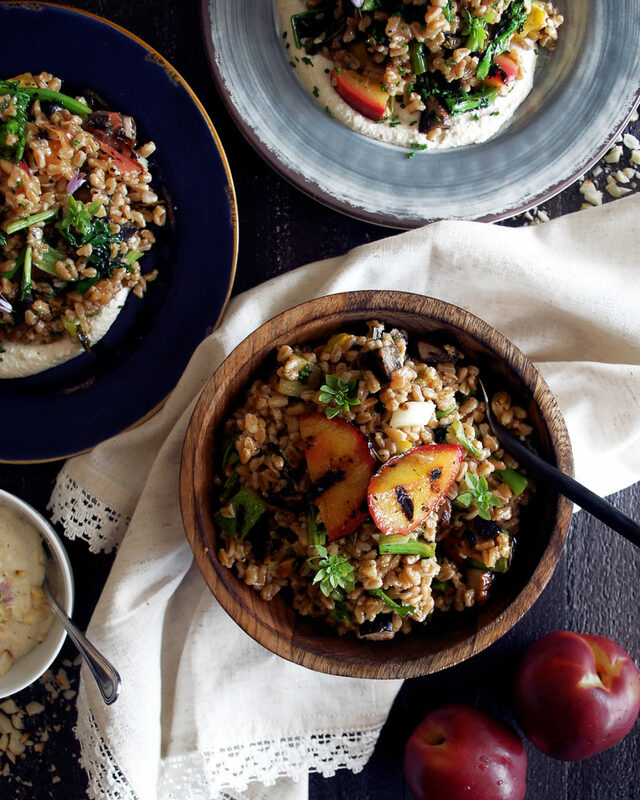 Farro is cooked quite simply, just by combining it with liquid and simmering until tender. I add fresh garlic and thyme to chicken stock in order to create a really flavorful liquid for the farro to cook in. A restaurant trick to cool the farro down, or really any grain for that matter, is to spread it out on a sheet pan once it’s finished cooking. By increasing the surface area, it’ll cool faster and prevent the grains from becoming mush. Once the farro is cooled off slightly, I like to stick it in the refrigerator for a bit. I’ll bring it back out after about 20 minutes to let it reach room temperature. I found that that’s how this salad is best served, not completely chilled and definitely not hot (I heated it up for leftovers the next night and absolutely hated it). Apart from farro being a really delicious grain, and an extremely healthy one, this salad is special because I tried to get the most out of each ingredient and add a ton of great flavor by grilling a variety of different vegetables, some sweet like yellow squash and some bitter like the broccoli rabe. You want to combine different flavor profiles and textures to create an interesting grain salad. I even threw some peaches on the grill because when they caramelize, their sweet, rich flavor is unbeatable. 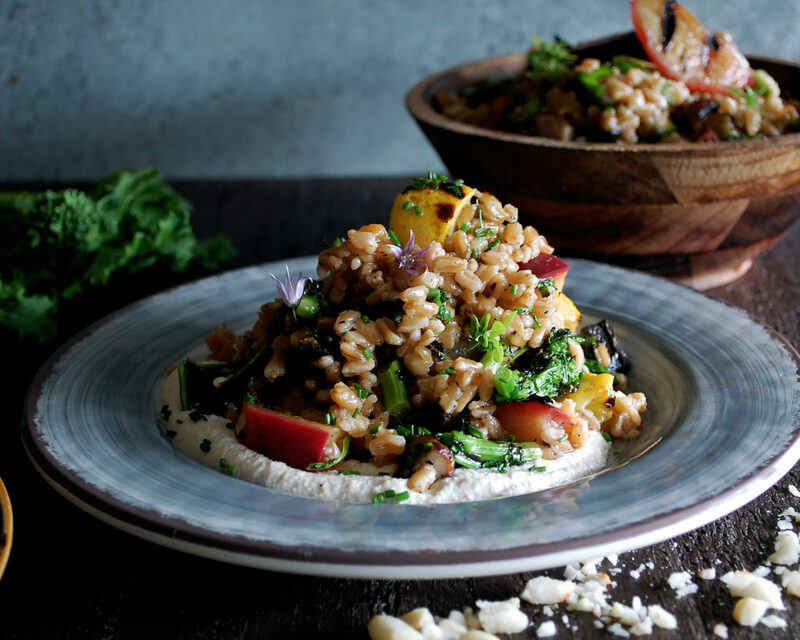 So, all the grilled fruits and vegetables get chopped up and tossed with the farro. Then, I coat everything with the charred lemon vinaigrette. It’s honestly such a simple recipe, but by charring the lemons, you add a whole different flavor to the equation. It’s smoky and sweet, while still being sharp and tangy. I highly recommend trying this vinaigrette, even if you just toss it with some greens and call it a day. It’s been my go-to for the spring/summer, along with a black garlic vinaigrette that I’ll be sharing in an upcoming post. Last but not least, the goat cheese macadamia butter. 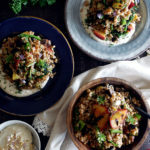 I spread it right across the bottom of the plate so every bite of farro salad gets eaten with a creamy, cheesy spread. Enjoy! Combine the farro and stock in a pot. Use the back of your knife to crush the garlic cloves. Add them to the pot, along with the sprigs of thyme and a pinch of salt. Bring the stock to a boil over medium-high heat, stirring just enough to distribute the farro within the liquid. Once boiling, reduce the heat to medium-low and simmer for about 30 minutes, or until the farro is plump and tender. If there is extra liquid, drain it off. Spread the farro out onto a sheet pan and let cool slightly. Refrigerate until completely cool, and then let it sit out at room temperature until ready to serve. In a sauté pan, add the macadamia nuts and toast over medium heat. Once the nuts are slightly charred (they should have a good amount of color on each side), lower the heat and add the water. Gently simmer the nuts until tender, or until most of the water has evaporated. This process should take about 30 minutes. Cool the nuts and add them to a food processor, along with the excess water. Pulse until smooth. Incorporate the goat cheese, olive oil, and salt. Taste the spread and adjust the consistency/seasoning by adding more water/salt if needed. Reserve until ready to serve. Preheat the grill over high heat. Leave the scallions whole. Trim the ends off the zucchini and yellow squash. Cut each in half and then into ¼ inch planks. Remove the stems from the portobello mushrooms. Trim the ends off the broccoli rabe and remove any large leaves. Cut the peaches into wedges. Cut the lemons in half. Once all the vegetables are ready, toss them with a generous amount of safflower oil, salt, and black pepper. 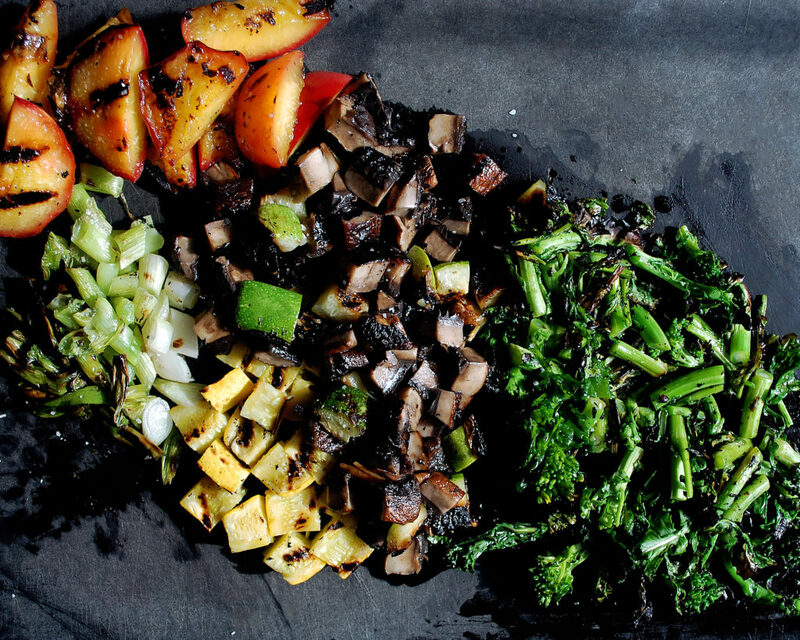 Grill the fruits and vegetables until they are slightly charred and tender. Remove them from the grill and cool slightly. Dice the scallions (removing the root end), zucchini, yellow squash, mushrooms, and peaches (I like to reserve a few grilled peach wedges for garnish). Roughly chop the broccoli rabe. Reserve the lemon halves for the vinaigrette. Juice the lemons through a strainer into a mixing bowl (you want to end up with ¼ cup of juice). Add the balsamic and honey. Whisk until smooth. Slowly drizzle in the olive oil as you continue to whisk until incorporated. Season with salt and black pepper to taste. Stir in the basil at the end. In a large mixing bowl, toss the farro with the charred lemon vinaigrette and the grilled fruit and vegetables (everything should be served cool or at room temperature, not chilled or hot). Taste and adjust the seasoning if needed. Spread the goat cheese macadamia butter onto each plate. Mound the farro salad on top. Garnish with basil flowers, chive blossoms, and the grilled peach wedges.